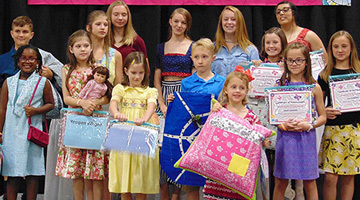 Today's young sewers (ages 9 - 18) can show off their projects and share the fun of sewing and quilting with a live audience in Sewing's Next Generation: Youth Fashion & Project Show. Get an insight into the interests and talents of our newest sewing enthusiasts as they show off their latest accomplishments. Whether it hangs in the closet, hangs on a wall or hangs out on beds and sofas, the creativity involved will inspire audiences of all ages. First, second and third-place winners are awarded in each of two age groups: 9-13 and 14-18. Winners will receive a prize from Original Sewing & Quilt Expo. Everyone who participates will get a certificate of achievement and gifts. Open and print the Entry Form and Rules and decide which one of your projects or outfits you would like to show off! Begin by filling out Form #1, the Participant Form. If you’re under 18, have your parent or guardian review and sign Form #2, the Rules Form. Return both forms by regular mail or fax to our offices at your earliest convenience. We can accommodate just 50 entrants; so don’t wait until the last minute! Each participant and accompanying adults will receive FREE General Admission passes for their day at Original Sewing & Quilt Expo. Please arrive with your project at the Registration Area between 8:00am and 11:00am on Saturday, as judging starts at 11:15am. Expo staff will be there to receive your project and help you get started on your day at the Expo.